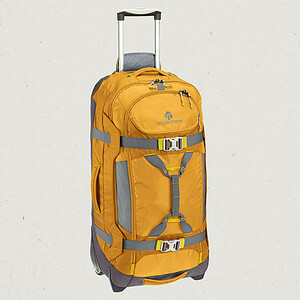 My primary bag is an Eagle Creek Gear Warrior 32″. I searched for quite a long time to find a bag I was comfortable with. I eventually settled on the Gear Warrior back in December 2012 and I’ve been happy with it ever since. It is long enough to easily house my tripod, it lacks unnecessary pockets or straps on the exterior which just get caught in airport baggage conveyor belts, and has ample space for everything I need. The wheels have survived gravel roads, cobblestone streets, and if the bag had an odometer there would probably be 10’s of kilometers on it already. While there are scuff marks on the bag from the handling it has gotten, none of the stitches has come loose and the only flaw I’ve seen is a screw on the handle which came loose, and I was able to tighten that by hand. I abandoned using a backpack in 2010 because it was just too much for my back and I realized that I almost always traveled in places where I could drag my bag using wheels. I have yet to find a camera bag I am happy with. For the last 2 years I’ve been using bags from Timbuk2. They are OK and get the job done, but they are becoming limiting as carry more camera gear. 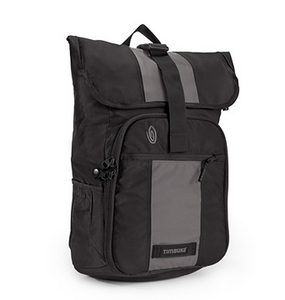 The bag I’m currently using is the Timbuk2 Espionage. The nice part about the bag is that it doesn’t have a zippered top, so the amount I can put in is variable. There is also no zipper to break. The slot in the bag for the laptop is so low that things inside the main compartment are always getting in the way of putting the laptop in the bag.